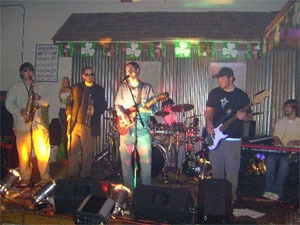 Though it may seem like three, Half Moon has been providing entertainment for over two years. During that time, the music has evolved along with the members; fusing simple minded jam band music with bi-pedal classic rock into what is now a cruel hu-manzee of sound; alternately described as bitchin and natures cruelest joke. Half Moon can, and often does, play in a variety of styles; showcasing influences from Johnny Cash to Stevie Wonder along with mind bending originals that will leave you wondering why you didn’t play guitar if it were that easy. Thanks to all of our loyal fans for keeping us from real jobs. It's real down-to-earth people like you, wasting their time on Myspace, pretending to work, and drinking on their lunch break that keep us focused on getting into the bars and off the street.